An Art Space for research, productions and exhibitions in Grundarfjordur, West Iceland. Artak350 Residency is an Artist Residency Program located in Grundarfjordur, Snaefellsnes Peninsula, Iceland. Founded in 2019 by Artak. The aim is to stimulate creativity through interaction with the local environment and to foster relations between participants and the local community. We work in cooperation with the local schools and artists giving our artists the opportunity to breath in the spectacular view and let Icelandic nature be an inspiration for their art. With the open fjord at your front step, big stunning mountains, and the charm of a small fishing village. Artak350 Residency is a place for artistic research, art production, meetings, workshops, art courses and exhibitions, an opportunity to meet strangers and make friends. The duration of this residency program is one month, maximum two months. This residency is for visual artists from all around the world who want to be inspired by Icelandic nature and culture, work on their art and develop their projects. We offer artists in residence the possibility to live in the studio: single bright studio which is provided with wifi, work desks, shelves, closet and two single beds. Breathe in the stunning view of the fjord, Grundarfjordur is a small town with easy access to wild nature. We are located in the center of the village, close to shops, restaurants and coffee houses, just a few steps away from the harbor where you can watch the boats as they come in after their fishing tours. 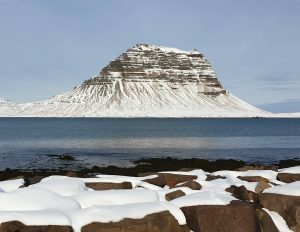 Enjoy the beautiful ocean view with the towering mountain Kirkjufell, the most photographed mountain in Iceland. We can accommodate one or two artists at a time, in a private apartment with a studio space, fully equipped kitchen & bathroom. Basic equipment is also available in the studio, however artists are responsible for bringing their own materials as there is no shop with art supplies in the area. It’s possible to ship your art supplies via mail before arriving. One month: 700 EUR – additional 350 EUR for second artist/partner. Electricity, heating and water. WIFI. Note: Once your application has been approved, your place will be secured upon receipt of full payment. Travel, transport, visa, daily living expenses, medical insurance and production are not included. Unfortunately, we don’t offer any grants but we formally invite all our applicants to seek grants elsewhere. On the last weekend of their stay, the artists are expected to give a presentation and/or exhibit their work at the studio or the visitor center. In order to submit your application, fill in the form online and please send an email to artak350res@gmail.com. Your full name – months preferred. Motivation letter (including a project/concept, description, 250-words max.). Examples of your work (max. 12 photos). Residents will be selected by the Artak350 Residency committee, based on their work, commitment to their practice and ability to interact positively with the community at large. All applications will be answered as soon as possible. If accepted, you have one week to confirm your participation and 14 days to pay a deposit of 200 EUR to guarantee your position. Full payment needs to be transferred four months prior to your stay. The deposit is refundable in case of cancellation within 4 months notice prior to arrival date.